The Maine Outdoorsman: Fishing Tall Tales . . . Fishing Tall Tales . . . fun with Photoshop! I had to share this picture I edited over the weekend. 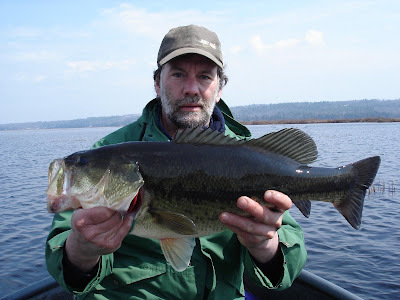 Picture is of my neighbor and a bass he caught. He wanted to send the photo to a friend of his and "brag" a bit about the Maine fishing scene. Before he sent I worked my "magic". It isn't a perfect job and if you look carefully you will see where I made errors BUT overall should actually convince most. Goes to show that these days you can't even believe what you see. Happy Fishing! yeah you are a natural,you should quit your day job and just photo shop for a living. Awesome! I'll have to send you a doe or a cow photo to shop in something... how about a doe mulie with elk antlers? But seriously, that looks great. It looks like you brought out the scales as well! HAHA, I can do just about anything with a good photo and a little bit of time. Fish are the easiest as you simply select around them and then give them a good stretching! TBD, Quitting my job sounds so refreshing . . .